This book has been in the stack for a long time. It was purchased when the Field Museum had an extensive exhibit on chocolate many years ago. I've read Emperors of Chocolate by Joel Glenn Brenner, which is a fantastic read about the early rivalry between Milton Hershey and Forrest Mars. The author of that book was able to gain access to the highly secretive worlds of both companies. Although out of print, if you are at all interested in why these two are at the top of the heap, then search it out. I might still have my copy kicking around somewhere. Therefore, when I saw this in the Field Museum's gift shop, I thought it would be the perfect complement to the current history of chocolate, meaning the 20th Century. Let's go backwards and read about where chocolate came from. It's probably not fair to compare the two books. Brenner's book is more topical. You can wander any grocery aisle and see the objects of her tome. 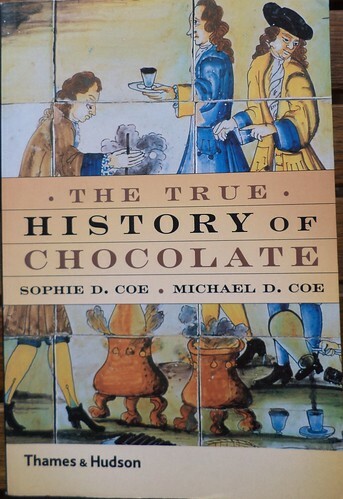 This book sets out to be more scholarly, tracing chocolate back as far as records will allow. That is both a strength and a weakness. If you are interested in historical accuracy, this book will appeal. It took me a month to read it because it felt like the book of a required class. The original author, Sophie Coe, died before she could write it. Her husband, Michael, assembled the book from her extensive notes and research. The bibliography alone, was some 20 pages. If I were taking a class on the history of foodstuffs, this is a book I would expect to be on the syllabus. It's not something, unlike Brenner's, that would go stale quickly. Brenner ends with the current crop of Mars children who run the company, so it will be somewhat dated. As this book goes back to the Mayans, there aren't named people around to date it. Coe did an incredible job of research. I can't imagine anyone finding anything else in the historical records to illuminate how cocoa was grown, used as money, and assimilated into European culture. The only thing would be more accurate translations of Mayan and Aztec pictographs. Coe admitted that some things scholars just don't know and this includes the pervasiveness of cocoa in Mayan and Aztec life. The book goes to the 19th Century in tracing how chocolate, both as a drink and as an element in eating, took over Europe. Essentially, we have the Jesuits to thank for chocolate going from Mexico to Spain and then Italy. It didn't really catch on in the far East; Japan, China, India; as they had their own culinary creations and trade did not include chocolate for a long time. There is a discussion of how different chocolate is today with what it was like when the Spanish conquered Mexico. There is a company, chocovivo.com, which is making chocolate the way the Mayans and Aztec made it at the time of Cortez. Having read this book, I stumbled upon the web site through an unrelated article in the May 2014 issue of Cooking Light. Reading about the process they use to make their chocolate was like reading the early chapters of this book, although in a much more friendly style. I think that's my biggest gripe about this book. It's overly scholarly. Michael Coe mentions he is trying to do his late wife justice by writing the book, "but I lack her humor". At times, I felt like I was slogging through cocoa liquor. Am I enlightened? Yeah, a bit, but retaining all of the information in the book is just not going to happen. I felt like I should expect a quiz at the end of each chapter. This is not a book for popular consumption. It has left me with a desire to learn more about the Jesuit order. They have a bad rap for things like the Spanish Inquisition. I feel as though I should learn more about this Catholic order to know more about world history. The Jesuits and the Dominicans hated each other but both were instrumental in the preservation of what little Aztec and Mayan culture they came upon by the time they made it to Mexico. It was intriguing to me to read that both orders decried the use of the native population to work on the chocolate plantations. Unfortunately, this led to the importation of African slaves. They didn't seem to have a problem with that. The other thing that struck me and which I'm sure has been rued, is how Cortez decimated the local culture. It is known there was a huge oral history among the Aztecs when he came to what is now Mexico City. In slaughtering the rulers to feed his greed, he destroyed this history. For instance, native "doctors" utilized thousands of plants from the jungles around the city. They knew what each plant could do with regards to its medicinal value. The European medical model at the time was frozen, attached to the ancient Galean model of 4 humors of the blood; wet, dry, hot and cold. This was woefully outmoded. How much farther along our medical advancements might have been had this information not died with the scholars. At times like this, you sort of wish for a time machine, to go back and grab the information and attempt to get it placed somewhere that future generations would learn from it. While this rumination is interesting, it's a fault of the book. The author tried to shove everything his late wife found between the pages. In getting people to adopt cocoa as a drink, it had to be shown that it helped one of the humors, but the author spent a good 5 pages explaining early medicine, tracing its history to the time where chocolate had made its way to Spain. Was there no editor handy to say, "This is interesting, but condense it."? Again, this kind of thing is found in a scholarly tome and not a book you'll pick up off the stack at the local bookstore. This will be added to the give away pile. I can't say that I'm glad I read it. I'm glad it's out of the to be read stack. Perhaps, down the road, I'll stumble across something and it will trigger a memory of reading this book. Compared to the three previous books, this was an effort to get through. Now on to book #5.